A topic not commonly discussed in the news is surrounding an animal that has been almost completely forgotten in the eyes of the American public: the wild horse. When these animals are mentioned, people think: “What’s the controversy with wild horses? They’re wild.” Most people imagine these horses simply roaming the six hundred and forty acres of land owned by the federal government and dedicated to the public. However, these wild horses are no longer wild. One solution to the overpopulation crisis is to simply release the wild horses back onto public lands and let them be wild again. However, Masters states that, “Ecologists, rangeland managers, and ranchers are concerned that overpopulated wild horse herds have caused and are causing irreversible damage to delicate desert ecosystems.” Letting them roam free is not a viable option. Keeping the horses penned up is also not a smart decision. The cost for all 45,000 of these horses is approximately $50,000 per horse over its lifetime. 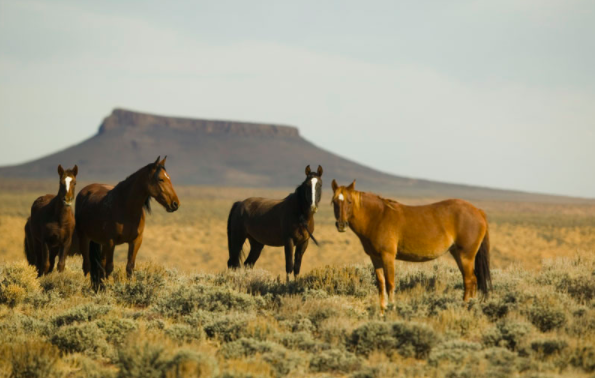 That means that the vast majority of the BLM’s budget goes to feeding horses in holding pens, which limits the agency’s ability to gather other horses off the range thus, leading to more degradation of the land. These not-so-wild horses horses have nowhere left to go. Ranchers and ecologists do not believe in releasing them, while animal rights activists do not believe in keeping them caged. I believe that the only feasible solution to this dilemma is adoption. Today, horses are still a greatly desired tool and form of transport. Ranchers will pay tens of thousands of dollars to own a basic horse while there are still tens of thousands of worthy mustangs waiting to be adopted. Even though these wild horses are characterized as untrained, unmastered horses, they at least deserve a chance. They deserve a shot to prove themselves worthy. If you want to save the wild horses of the American West, adopt a mustang.